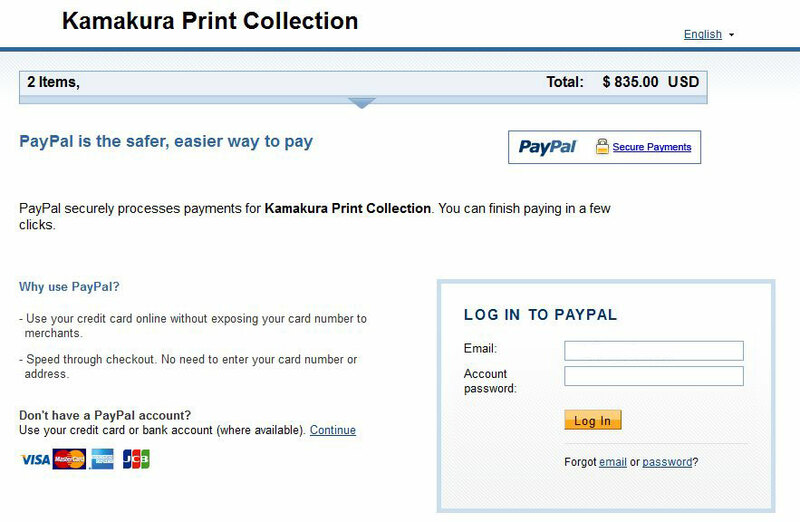 To purchase prints on-line from The Kamakura Print Collection, please use the order button on any full-screen page. 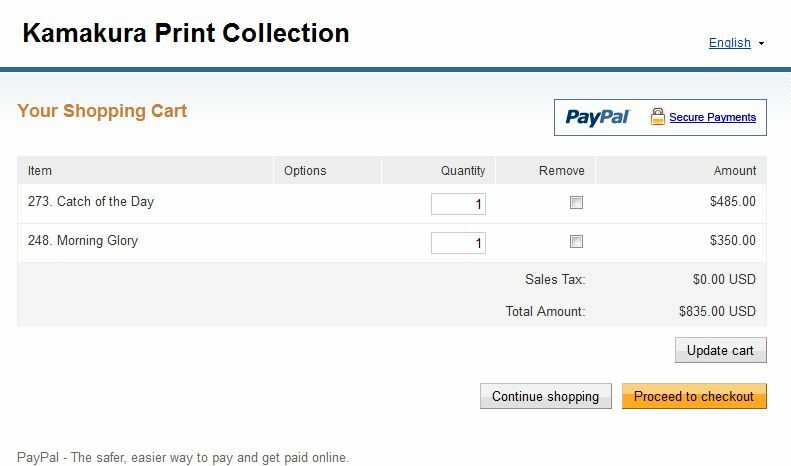 Clicking the order button displays the number, title and price of that print on a PayPal order form. The page appears in English or 日本語, depending on where you are. You can change the language setting as needed. You can also pay directly at PayPal by clicking this link: PayPal.Me/kamprint Simply insert the Dollar amount, which wll be automatically converted to the currency of your choice. In the PayPal message space, please let me know which print or prints or books you are purchasing. Your registered mailing address should appear, but to be sure, please put your postal mailing address in the message space, too. You will receive a payment-confirmation message by return, and the purchased prints or books within a week to 10 days. There are no other costs -- shipping is free -- the amount you pay is the full amount. Payment may be made in USD, Yen, Euros, GBP, Swiss Francs (CHF), Swedish Krona (SEK), Danish Krone (DKK), Norwegian Krone (NOK), Japanese Yen (JPY), Hong Kong Dollars (HKD), Singapore Dollars (SGD), Australian Dollars (AUD), Canadian Dollars (CAD), or New Zealand Dollars (NZD). PayPal will automatically calculate the cost in the currency you select for payment. By paying through PayPal, you can use your card without sending your card number each time. 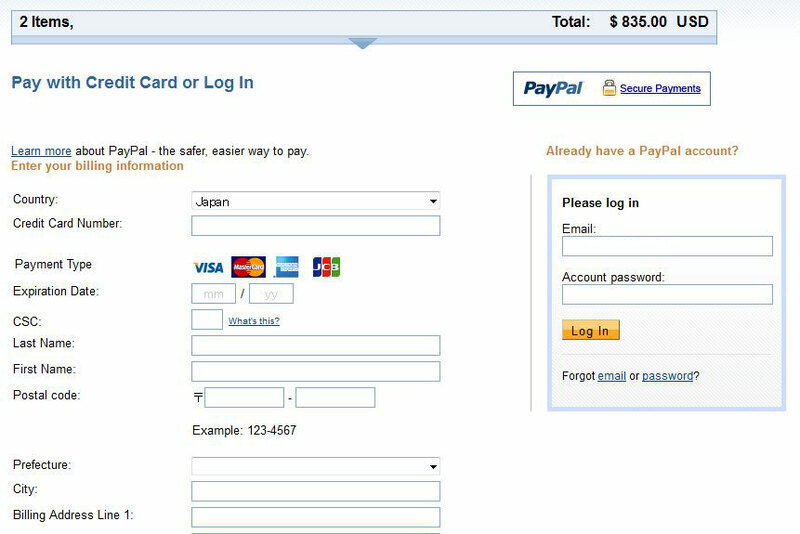 A one-time signup is necessary to link your card to PayPal's authentication service (or to establish a PayPal account if you wish). After that, purchases can be made at this site, or at any other site that uses PayPal, simply by clicking the order button. This method of payment is faster, more secure, and far less expensive than bank fees. Confirmation will be sent to you immediately upon payment, and shipment tracking information will be sent to you soon after that. 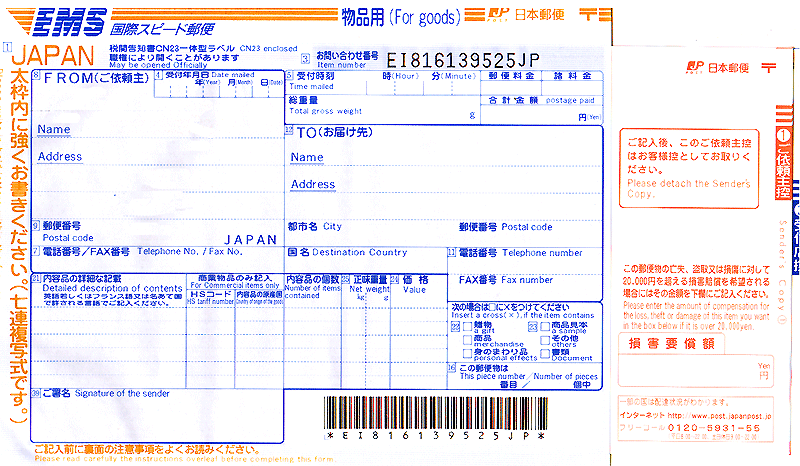 Shipment to destinations outside Japan is by EMS airmail, which also provides shipment tracking information on-line. Within Japan, we ship by Post Office Yu-Pack. Buyers in Japan may also choose to pay on delivery by Yamato takyubin service. To order, find the print, and click the order button next to it, which looks like this. 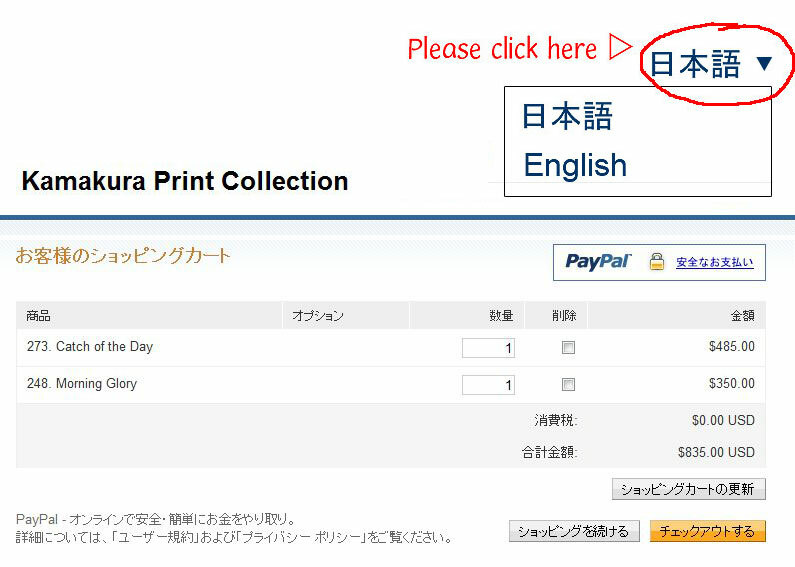 On any full-screen image page, simply click this order button to purchase the print shown. Payment occurs only after you confirm by clicking 'Complete Checkout' -- until then, your order can be cancelled or modified. To view or modify the purchase list, click the soroban icon from any full-screen image page. The 'view or modify' button looks like this. Your prints start their journey at this local Post Office in Kamakura and arrive at the ship-to address you entered on your PayPal order form within ten days or less. 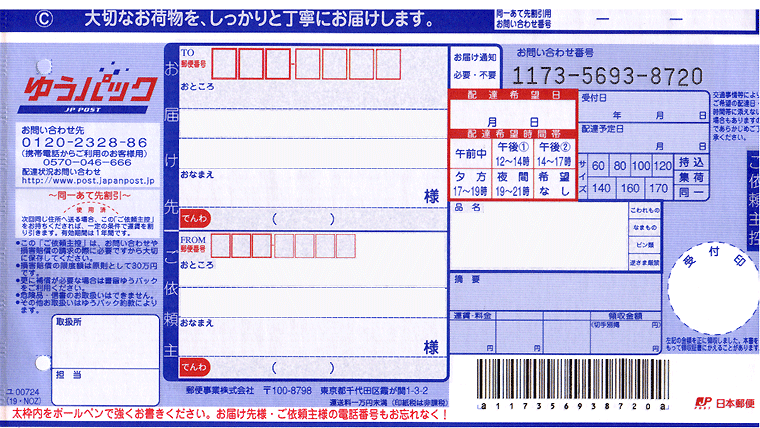 The EMS or Yu-Pack forms have a tracking number to enable tracing of any shipment through Japan Post (tel in Japan: 0120-5931-55; English: 0570-046111). Prints are securely packaged in double-reinforced flat boxes, and insured. Shipping and insurance are free for Web orders, so it's easy to figure your total cost: the price of the print, and nothing more! If any print is unavailable, that portion of your payment will be refunded or applied to another print, whichever you prefer. Any undamaged prints may be returned within one month of purchase for a full refund less shipping cost, or exchanged for other print(s) if preferred. The EMS Tracking Number may be used to track the progress of the shipment. Simply enter the EMS number -- which is provided to you by email when the shipment is made -- and this convenient English site of the Japanese Post Office tells you exactly where the package is. Moscow: Alexander Filippov: Alexander.Filippov75@gmail.com , +7-915-146-4428, 12, Krivokolenniy per., Moscow.